Obituary – Fitchett, Cleta Mae (MeWherter) « Perry High School Alumni Association, Inc.
Cleta Mae Fitchett, 75, Cushing, former Perry community school teacher, died Monday evening at Cushing Regional hospital. Funeral will be at 10 a.m. Friday at the Fairley-Hackler funeral home at Cushing. Officiating will be Rev. Charles Thomas, Rev. Gary Hill and Dr. Bill Young. Burial will be at Fairlawn cemetery at Cushing. Mrs. Fitchett, daughter of the late George and Mary MeWherter, was born at Orlando, May 5, 1909. 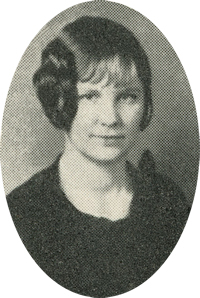 She attended Perry schools and Oklahoma A&M at Stillwater. She was a former school teacher in the area. She and Allen D. Fitchett were married May 27, 1931, at Ponca City. Fitchett during the 1930’s was Noble county superintendent of schools. The couple resided on a farm near Morrison before moving to Colorado where they lived for six years. The Fitchetts moved to Cushing in 1950. Mrs. Fitchett was a member of the Cushing Christian church. In addition to her husband, of the home at 1026 East Oak, Cushing, survivors include one daughter, Mrs. Leon (Pat) Wood, Cushing; a son, Allen Darrell Fitchett, Wichita, Kan.; six grandchildren and 10 great-grandchildren.